This article shares a day in the life of an Occupational Therapist. Thought, like Physical Therapists, Occupational Therapists can work in a variety of settings and specialize in multiple areas of rehabilitation. According to the AOTA website, occupational therapists work with people in clinic settings, community centers, rehabilitation hospitals, nursing homes, and even in home health settings. Within these environments, an OT can help people with issues such as stroke, traumatic injuries, Alzheimer’s disease, and other neuromuscular diseases. The goal of an occupational therapist is to help restore function independence in whatever ‘occupation’ of life you are currently in. An occupational therapist is not restricted to working on one body part or in one work setting. Today we’ll share a day in the life of an occupational therapist who works in an outpatient clinic associated through a hospital. This clinic specializes in hand rehabilitation and the therapists are CHTs or Certified Hand Therapists. As an Occupational therapist with a certification in hand therapy, my day is centered around treating patients with injuries to their hand, elbow, and even shoulder. 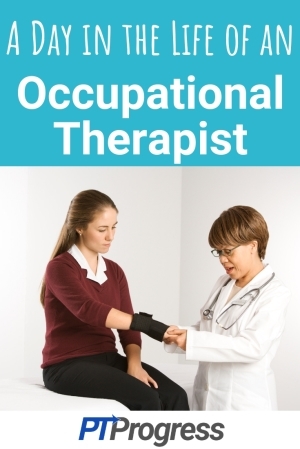 A CHT designation (Certified Hand Therapist) can be attained by both OTs and PTs, but 85% of CHTs are Occupational Therapists according to the HTCC. While not all OTs focus on hand, elbow, and shoulder, the overall goal to restore function and independence is the underlying focus for our profession. Working 40 hours a week is typical for occupational therapists, but it’s common to work less depending on the setting. Depending on the clinic, you may find multiple OTs who choose to work on a part time basis. My typical day is from 9-6 four days a week. In an outpatient clinic, the hours are typically later so you can help people who work during the day. Most days I have between 13 and 16 patients on my schedule. For a 10 hour day, this can make for a steady flow of patients, but it requires some coordination as well. We schedule each patient on the half hour, but sometimes the treatment overlaps. Managing multiple patients throughout the day requires some planning ahead. It’s 9 AM and my first patient is here. He just had surgery on his thumb two weeks ago and is here for an evaluation. We’ll spend the next hour detailing his medical history, taking measurements and assessing the wound and incision site. Evaluations generally take 45 to 60 minutes and require a lot of data entry and measurements. I’ll spend an additional 20 minutes sometime today finishing the therapy documentation notes and forwarding the evaluation to the physician. My next patient is here for a follow up treatment for tennis elbow. She has been coming her for the past 2 weeks and is now starting to feel like she can use her hand and arm again without sharp pain. We’ve been working on stretches and relaxation techniques as well as modifications to the way she uses her arm and hand throughout the day. I’ll see four more patients before lunch, each arriving on the half hour. Sometimes they arrive early, so we can get started with warm ups or even heat to the hand to help with tissue extensibility. Lunch is usually pretty quick because I never know if we’ll get a walk in patient. The hand surgeons in the region often send patients over if they need a splint, so we try to squeeze them in to the schedule. These walk ins can come at any time, so we need to be flexible! For the most part, I can finish the morning documentation notes for the patients during my lunch hour. The afternoon stays very busy with patients who need the later time slots because of school or work schedules. In this 4 hour block of time, I’ll see 6 returning patient as well as one new evaluation. As an occupational therapist, I see a wide range of patients both younger and older. There is always a variety of diagnoses or medical reasons people need therapy. I may treat someone who has carpal tunnel in the morning and build a split an hour later for someone who just had surgery on their finger. The variation in patients and treatments is what makes the day go by quickly. I enjoy the challenge of my work and coming up with solutions to help my patients restore their movements and to return to their activities of daily living. My last patient just finished, but I’ll need to stay for the next 30 to 45 minutes to work on documentation. Writing documentation for each patient is required for insurance companies, but it’s also helpful for the therapists. My notes share details on the treatment we performed that day and my assessment of how they are improving. It’s also a way to track the patient goals to make sure we are working on the right things! Working as an Occupational Therapist is fulfilling because I can help people return to doing activities they need to perform for work and home.